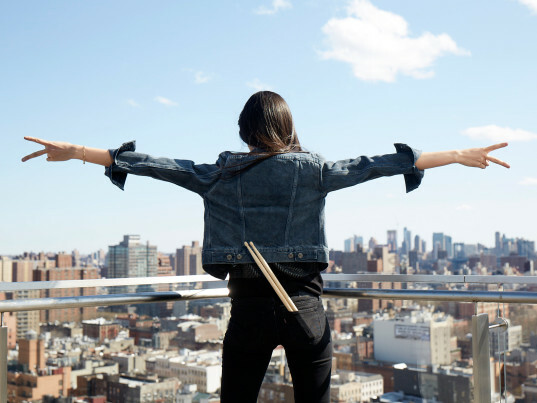 On World Water Day, Levi’s made a bold move. Borrowing a page from the tech industry, the denim giant went public with its “Water<Less” process—the same water-squeezing finishing techniques that it has honed for the past nine years. Trade secrets, the company reasoned, have no place in a drying world. If the rest of the apparel industry can learn and build upon its innovations, it could rack up water savings of at least 50 billion liters by 2020—enough to supply every family in New Orleans for a year. Ecouterre caught up with Michael Kobori, vice president of social and environmental sustainability at Levi Strauss & Co., to talk about the company’s trail-blazing decision, its obsession with water footprints, and why it’s mandating water education for all of its employees. For those who don’t know, what is Water<Less and why does it matter? Out Water<Less techniques are a series of innovative finishing techniques that use less water than traditional methods, but still achieve the same great look our consumers want. Our designers challenged our production team to do this after seeing the results of our product life-cycle assessment, which showed us that a pair of Levi’s 501 jeans uses a significant amount of water—3,781 liters. We use 21 different techniques that can save up to 96 percent of water in the finishing process. Since the program began five years ago, we have saved over 1 billion liters of water. The Levi’s products that are made with any of these techniques are referred to as our Water<Less products. Why are you making the techniques available to the public? We’re making an impact at reducing water use in our own products, but realize more work needs to be done. Water supply is one of our planet’s greatest challenges and, for us to meet it, we need everyone’s help. By open-sourcing our Water<Less techniques, we hope other apparel companies will adopt them and save water in their own production processes. What kind of impact are you hoping to see from this? If all the other denim producers in the industry adopt our Water<Less techniques, we estimate the industry could save up to 50 billion liters of water by 2020. Why is water education so vital? Our life-cycle assessment also showed us that a big portion of the water consumed over the life of a pair of jeans is during consumer care, specifically when it comes to laundering. It’s critical that we educate our consumers on better water-saving habits. We created our “Care Tag for the Planet” that outlines the most sustainable way for consumers to care for their products: wash less, wash cold, line dry and donate when no longer needed. This label is found in all of our products today. We’re also educating consumers through different marketing campaigns, including our “Are You Ready to Come Clean?” quiz. How will training your employees through the White House Water Summit help Levi’s become a better company? In this fight to preserve our planet’s most precious natural resource, Levi Strauss & Co.’s employees are one of our greatest assets. As a 163-year-old company with an established reputation of social and environmental responsibility, we have an influential voice. That’s why we committed to the White House that we would train 100 percent of Levi’s corporate employees in our Project WET curriculum by 2020. The goal is to increase employee awareness of the social and environmental impacts of apparel, and to train them to become water conservation ambassadors so they can share what they learn in their communities. Water<Less started out with a line of jeans in 2010; how has it evolved since then? 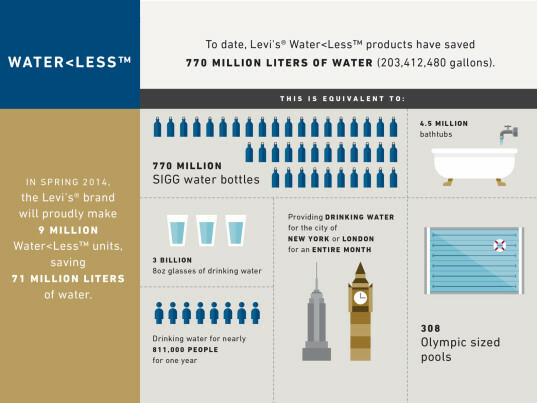 Water<Less products went from zero percent of our total product volume in 2010 to 28 percent today. Our goal is that by 2020, it will be 80 percent of our total product volume. We’re confident in our ability to do this because today every new finish that comes into our product line is developed using Water<Less techniques. How else is Levi’s saving water? Levi’s has been a leading driver of change around water use in the apparel industry for more than 20 years. We’re focused on three key areas when it comes to addressing water issues across our supply chain: the planet, production and people. We were one of the founding members of the Better Cotton Initiative, which focuses on decreasing the environmental impact of cotton, improving labor standards and increasing economic livelihood for farmers. Our goal is to source 100 percent of our cotton from BCI and recycled cotton by 2020. “Our goal is to source 100 percent of our cotton from BCI and recycled cotton by 2020. At the production level, along with our Water<Less techniques, we’ve also saved 30 million liters of fresh water through the industry’s first Water Recycling and Reuse Standard, which we piloted with one of our vendors in China. We’re sharing these techniques with other vendors in hopes to see similar water savings. We were also one of the first companies to establish a Restricted Substances List and are committed to achieving zero discharge of hazardous chemicals by 2020. And when it comes to people, through our worker wellbeing initiative, we’ve identified Water Access, Sanitation and Hygiene (WASH) as a critical need for workers who make our products, their families, and their communities. Through factory and community-based programs, we’re helping to educate workers and their families about safe drinking water and hygiene—both within and outside the factory walls. 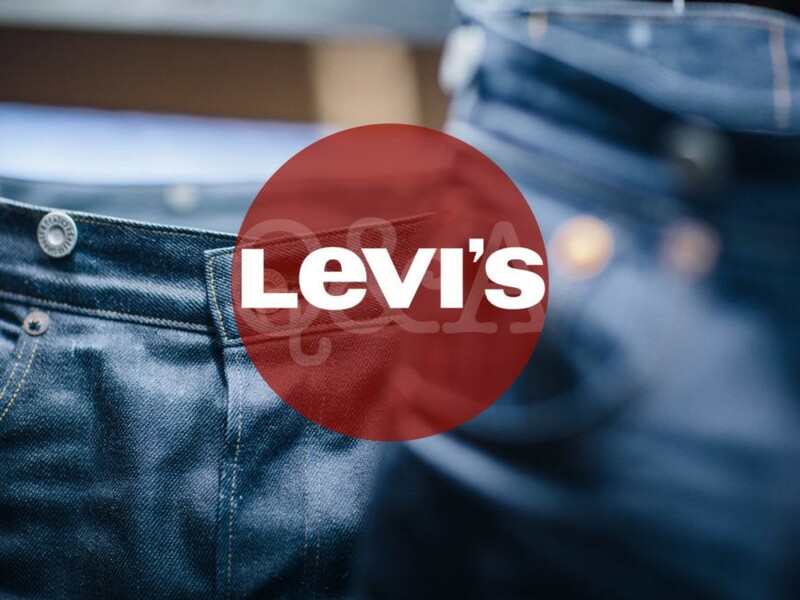 On World Water Day, Levi's made a bold move. Borrowing a page from the tech industry, the denim giant went public with its "Water<Less" process�the same water-squeezing finishing techniques that it has honed for the past nine years. Trade secrets, the company reasoned, have no place in a drying world. If the rest of the apparel industry can learn and build upon its innovations, it could rack up water savings of at least 50 billion liters by 2020�enough to supply every family in New Orleans for a year. Ecouterre caught up with Michael Kobori, vice president of social and environmental sustainability at Levi Strauss & Co., to talk about the company's trail-blazing decision, its obsession with water footprints, and why it's mandating water education for all of its employees.